Am 1.4.15 bereits gab es ein CS:GO Update mit dem sich so einiges geändert hat. Unter anderem wurde die Tec-9 generft, diese macht auf Distanz nun weniger Schaden und die Magazingröße wurde auf 24 reduziert. Die M4A1-S kostet nun -wie die M4A4- 3200$, die MP9, MP7 und die Mac-10 wurden genauer. Hier wurden die Partikeleffekte so angepasst, dass es nun nicht mehr oder nur noch sehr selten möglich sein sollte, durch die Ränder der Smoke sehen zu können. In der Vergangenheit konnte man sich hierdurch einen unfairen Vorteil verschaffen, denn bei diesen sogenannten „One-Way-Skokes“ war es möglich durch die Hilfe eines Teammates über die Smoke zu sehen, aber vom Gegner kaum zu sehen war. Im Update wurde auch das Tagging angepasst, also wie stark Spieler verlangsamt werden wenn sie getroffen werden. Bei leichten Waffen wie Pistolen etc. greift das Tagging nu etwas stärker ein. Außerdem verursachen mehrere Treffer ein viel stärkeres Tagging als zuvor. Mehr zum Tagging könnt ihr hier nachlesen: What is Tagging and how does it work? de_Nuke wurde in die Reserves-Group verschoben und dafür ist de_train nun in der Active Duty Mapgroup. – Operation Vanguard has come to a close. 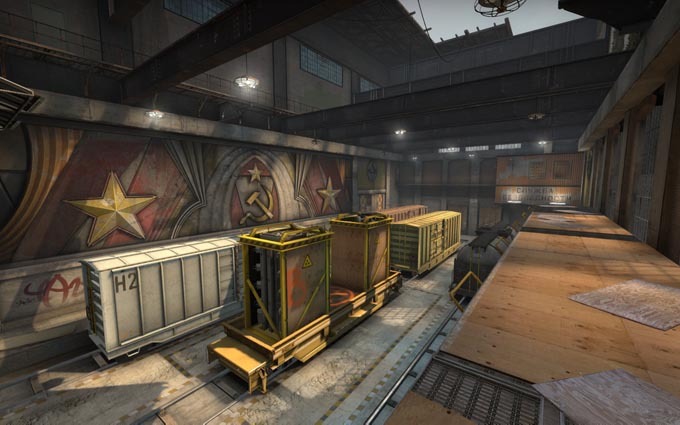 – Train has been added to the Active Duty map pool. – Nuke has been moved to the Reserve map pool. – Smoke grenades are now more reliably kept track of on the client to prevent mismatches between smoke particle visuals and screen overlay visuals. – Fixed players being able to double stack inside a smoke to peek out of the top (and be really hard to see from outside the smoke). – Updated expiration of the smoke screen overlay to match more closely to the visuals of when the third person particles expire and vice versa. – Updated the vertical position slightly of the smoke particles to reduce seeing though edges of the smoke (particularly at the bottom). – Fixed spectator sometimes not getting the smoke overlay for the player they are spectating when that alive player is inside smoke. – Improved spawnpoint selection code to not spawn at occupied spawn points or spawn points of a different team. – Increased price of the M4A1-Silencer from 3100 to 3200 to align the weapon’s price with its utility. – Increased Tec-9’s damage fall-off to reward players that close engagement distance. – Lowered Tec-9’s magazine size to 24 to reward more discriminate firing. – Lowered scoped movement values for AWP and Autosnipers. – The accuracy of the MP9, MP7, and Mac-10 have been improved. – Trade up contracts work on StatTrak weapons. – There is now a StatTrak swap tool available for purchase. It swaps the StatTrak value between two of the same weapon. – Fixed the server browser showing the map workshop path in the „Map“ column. – Added a sortable column to the server browser to display whether a server is running a map from the workshop or not. – Added a sortable column to the server broswer that displays icons for popular game mods running on that server. – Server browser will save the layout changes made between game sessions. – Updated the first time server browser pop up message. – Fixed scoreboard hiding at match end when you bring up a player’s Steam profile. – Added a game option in team options section to control whether lobbies get created with public access or private requiring invites for friends. – Added Flavor Text to the Bank collection. – Add surround sound support (quad/5.1) on Linux. – Marked nav commands as a cheat to protect against potential server exploits. – Chicken kills are now logged in CS event logs on game servers including attacker and weapon information. – HE grenade detonations are now logged in CS event logs prior to logging player deaths from corresponding HE grenade explosion. – Added sv_reliableavatardata 2 game server setting for LAN tournaments production. In this mode the game server will load player avatars from corresponding csgo/avatars/76512345678-.rgb files (or csgo/avatars/default.rgb if the corresponding SteamID avatar is missing), and avatars will be recorded in GOTV demos. To produce avatars rgb files tournament operators can place 64×64 png player avatars as csgo/avatars/76512345678-.png and run the client-side command cl_avatar_convert_rgb to convert all 64×64 png files into rgb format. – Optimized the process of logging in players to matchmaking backend during game updates.